Tomorrow marks the kick off of Nanowrimo! I'm filled with nerves and anxiety about it. I'm not anywhere near as prepared as I ought to be and I'm already looking at the goal of 50,000 words with some serious side eye. But I'm ready to take the leap and go for it. I enjoy the challenge and, after almost 6 months with basically no productivity on the creative front, I'm excited to have the chance to get some work done. I know that I am not going to end November with a ready-to-be-published novel, but with something kind of a mess and needing a lot of help. But that's part of the writing process. First drafts are almost always a messy affair that requires a whole lot of work to turn into the polished shiny novel that eager readers scoop up. Nanowrimo is the chance to turn off that inner critic and just sprint the novel race. Some days you might limp along, barely walking, and some days you may run a 7 minute mile of words, the thing is you keep moving and writing. I know a lot of people who don't participate in Nanowrimo because they think anything they produce during the sprint of November isn't going to be worth anything. But, for me at least, the point of Nanowrimo isn't just to create, it's to build the habit of writing. It's to commit to and finish a goal. I'm nervous as hell about this year's attempt. Every year I've committed to the 50,000 word dash, I've made it, and last year I wrote almost 90,000 words in November. But this year has been a slow slog through the muck of some serious depression and a lack of motivation. I've struggled to finish much of anything and I'm scared I won't make it to the finish line this year. But I know I'm not doing this race alone, there's a whole group of people here with me to help cheer me on. We're a team and that's an incredible soothing thought. 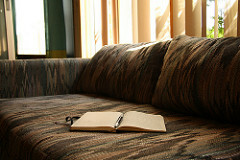 Writing can be a very solitary endeavor, and it;'s one of the things that I struggle with the most. Nanowrimo is the chance to build your tribe of writers to support you through the good and the bad. Everyone starts the race with the same blank page in front of them and rather than competing to finish the race first, the goal is to help everyone cross the finish line with you. It's one of the reasons I keep coming back to Nanowrimo year after year, the friendships formed as we all write our hearts out for the same goal. So, do whatever you need to do to get ready for the race of the year. I've prepped some meals, figured out the times (I hope) I'll be able to write with minimal interruptions and I'm working on deciding what I'll get as a reward for reaching my goal. I'm totally not above using briberry to get myself writing. So, whether you doubt you can meet the goal or if you're an old pro positive that this will be a piece of cake, don't be afraid to take the dive and get involved in Nanowrimo, it's not too late to sign up and join in on the adventure. And even if you aren't in the race, take the chance to encourage everyone who might be. Sometimes all someone needs is a hopeful voice shouting louder than all their own doubts. So, my fellow Nanowrimo-ers, come hell or high water, we are here and we are ready to write.